rocky's bru: Azim's ultimate handshake or untimely comeback? 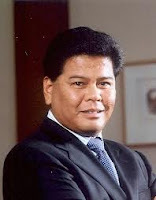 Azim Zabidi, the former Umno Treasurer, has somehow managed to revive a joint Iris Corp Bhd - Patimas proposal to offer biometric authentification services to the Election Commision. The proposal was thought to be dead and buried but now, minus Iris, talk is that Patimas is about to bag the contract on its own. Azim is only one of two substantial shareholders in Patimas. The other is China Private Equity Ltd, a firm listed on London's AIMS market. Azim recently put a motion to replace Patimas entire board, and replace them with buddies such as UDA's Nur Jazlan Mohamed Rahmat, a likely winnable Johor candidate for PRU13. 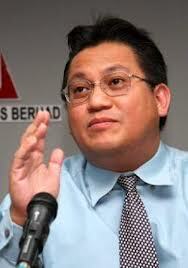 [Read Nur Jazlan joining hands with Azim Zabidi in bid for Patimas, Feb 4]. Quite a few people are looking at this as some former "4th Floor" boys coming back to the picture, at a time when PM Najib Razak could do without them. Just the other day, blogger Big Dog was bitching about some former Level 4 operatives in the driver's seat of a mega, mega deal in Johor. Read his The Four-in-Triple finger lickin' good! Wish khairy & fourth floor boys give rocky a tight slap. It's rocky who is bitching not others. Let these UMNO goons fight amongst themselves. After all they are only after money and position. Who cares? Looks like rocky is still afraid of the 4th floor guys. Who cares....whether it is timely or untimely comeback. People Power timely presence will dictate the future....not Umno b. Didn't Jazlan and KaliULAR meet over this recently. Azim was not there as but THE editor of a portal was there too, with Mr.Whiskey and his girls. We might have some pictures. For Rocky, only 2 types of people should be getting contracts, those aligned to mahathir and najib only including him. For the rest of you including fourth floor boys or no floor boys or the rakyat, you can all bugger off. Why look yonder and whack those buggers on the other side? Try keep the house here in order. After all they pay you and your bloggers big bucks. The Mega Mega Deal that is destined to cause BN its loss in the Coming General Elections!! The remnants of SIL 4th floor boys and the so called liberal malays like Jazlan, Tunku something from NS seems to be trying to hang on their dear life. I just dont understand why PM is giving them light of day. They should just be cold storaged and put aside. On KFC, where does it show involvemeBnt of Iskandar Water Front (controlled by LKH) as claimed by BigDog. Here is shareholding of MESB/TPSB as at 16 May 2012. If there are more updated documents please show. Can't wait to see Najib's GE 2013 candidate list. Majority of Malays sooooooooo sick of UMNO sycophants. If Najib plays his cards right, jaded Malays will return to the fold.